No one told me just how drastically your wardrobe can change after becoming a mom. You hear about all the items that you need for baby, but I didn’t really hear about what I needed to have in my own closet. In an effort to help new or expecting mamas be prepared ahead of time rather than figuring it out as you go along like I did, I put together a list of 10 essentials that I use every day. Keep reading to see what 10 wardrobe essentials every mom needs to make sure you have what you need to rock motherhood in style. I would love to say this is to be stylish with accessories but let’s get real. Sometimes mom life means you don’t have the time, nor the energy, to spare in order to get your hair looking decent enough to leave the house. A hat or headscarf is perfect for this. I love playing around with different quick & easy wrap styles. I saved a bunch or head-wrap tutorials on our Pinterest. My go-to is the turban wrap technique, done with $3 scarves from Target’s dollar aisle. A cute beanie, baseball cap, or oversized floppy hat can do the trick as well. 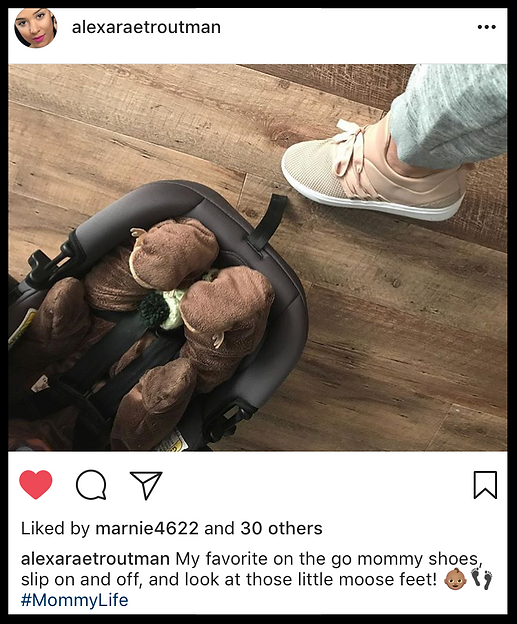 The photo above is mama, Alexa, wearing some super cute sneakers by Steve Madden. When you’re a mom, there will be times where sandals or flats just won’t cut it for the day-to-day tot wrangling. Being the girly girl that I am, I was very reluctant to get a good pair of sneakers but I was so glad when I finally gave in and got them. I usually try to look for the good deal or sale on most wardrobe items but these would be something that I would say to go ahead and splurge on. My husband talked me into getting a pair of Nike Huaraches and I pretty much wear them on a daily basis. To the park, the grocery store, you name it. Converse’s are a more stylish option but you will be sacrificing some comfort. I’ve also heard great things about Adida’s Ultraboost shoes. Jewelry is optional but it definitely helps to add an extra stylish umph to any outfit. The problem is when you are wearing your favorite necklace or dangly earrings and your baby pulls on it or tries to eat it. I’ve also found that chunky rings can often scratch the little one on accident. So definitely incorporate jewelry into your looks but try to keep it simple and keep your daily life in mind. You’ll want to look for non-dangly earrings, short necklaces that aren’t easy to grab onto, and non-bulky rings. There are even lots of baby teething necklaces for moms to wear that help you to roll with the punches of motherhood but still look cute doing it. Wedges are the best of both worlds: the height and stylishness of heels with the stability and comfort of flats. Personally, I’m a heels person. I would wear heels every day, every where, if I could. Not so realistic when your toddler demands that you carry them because they suddenly decided they’re just done walking at the moment. I’ve found that in more formal instances, such as church or weddings, wedges are a life-saver. Target usually has some really cute options that won’t break the bank and are surprisingly comfortable. DSW (the photo above) or TJMaxx are also good options for finding deals. If you just aren’t a heels kinda gal, look for a stylish pair of flats that you can wear when you want to dress up nice. There is a time in motherhood, usually the first 2 years of their kid’s life, when mama is in straight Survival Mode. You are extremely sleep deprived, you only get to eat whatever you can quickly grab and stuff in your face while on the move, you crave sweets because of your sleepiness (oh hey there, extra “baby weight”), and you’re lucky if you get a shower daily. The go-to bottoms for a mama in survival mode are usually leggings but let’s take it up a notch and go for jeggings instead. And when I say jeggings, I mean the super super stretchy jeans not the leggings with a denim look printed on them. Jeggings will give you the comfort you’re looking for in leggings without the obvious “survival mode look” that leggings give. Gap has a very stylish collection of jeggings. Levi’s 711 Skinny 4-Way Stretch Jeans are also a good choice or you can check out Macy’s collection of jeggings. The idea of dresses might seem like something formal and uncomfortable but they are actually very comfy, easy to throw on, and versatile. Try going for a casual jersey or cotton dress. No ironing or outfit coordinating needed. Just throw it on with a pair of Converse shoes and go! Learn which silhouette is the most flattering and comfortable for you. I really like straight cut or A-line dresses, as well as maxi dresses (so I don’t have to worry about shaving my legs hehe). You can find some cute and affordable t-shirt dresses here on Zaful. Finding that perfectly flattering t-shirt is just as hard as finding the perfect pair of jeans. It’s hard but much needed. And once you find that unicorn, get it in every color you can. And maybe even a few in one size up for your when you’re bloated. (Trust me on this.) You want to look for no-fuss fabrics that are easy to clean and that you can throw in the dryer. Try different necklines as well to see what looks and feels the best. I’ve found that Gap is a good place to start looking. As much as I would love to sit here and tell you to stick with the jeggings and stay away from the leggings, I’m not a hypocrite. Hell, I’m wearing leggings at this very moment! It’s gonna happen, so just go ahead and snag a few cute pair whenever you see them on sale. Ok, who are we kidding: stock up! We all have our days, mama. And that’s quite alright. 9. A Cross-Body Purse and a Backpack. It’s hard to get out of the house when you’re a mom. When the opportunity does arise you’ll want to be prepared. I’ve probably been out of the house child-free a handful of times but each of those times I had nothing to wear and had to scramble and get a top. Have a few tops that you can wear out or to a nice event but made of a fabric that is easy to take care of. Also, keep in mind the silhouette of the top and make sure you’ll be totally comfortable in it. I like to get flowy or slightly loose tops because I am still working on firming my abdominals and get self-conscious about my belly sometimes. 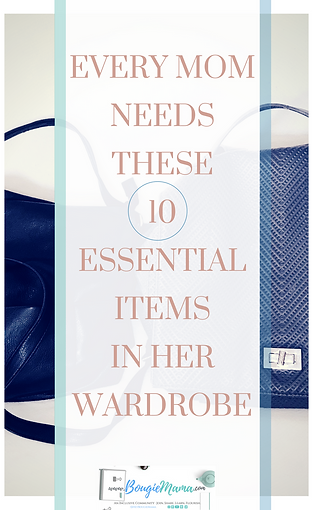 Those are my top 10 wardrobe essentials for every mom! Is there something else not mentioned that you can’t live without? Share with us in the comments below!